Auto Groups will create a new group for each separate poly object. Keep in mind that a separate poly object is not a SubTool but a part of the object that does not share any polygon faces and is self-contained. UV Groups will create a new group for each UV section of the model that is in a unique UV region (sometimes called a UV Tile). UV Groups, when used with Mesh Visibility, provide a way of working with UV regions in ZBrush. Auto Groups With UV with create new Polygroups based on the topology and UV continuity. Merge Similar Groups will merge Polygroups that have the same vertex count. The Merge Stray Groups function will merge all the isolated PolyGroups composed of one polygon or which are separated from the closest other PolyGroup by a single row of polygons. This function’s purpose is to clean the PolyGroups created by automatic functions, such as PolyGroups from PolyPaint. The Groups by Normals function creates PolyGroups based on the model’s surface curvature. This can be modulated by the Maximum Angle Tolerance slider. The Maximum Angle tolerance slider modulates the Groups By Normals Function, setting the angle at which a new polygroup will be created. The Group Visible button will create a single Polygroup from the visible polygons. If the Cover and Clstr sliders are used then random variations can be created. On the left, the original mesh is shown with a Coverage value at around 0.5 and Cluster at 0.75 to create the island effect of the new PolyGroup. 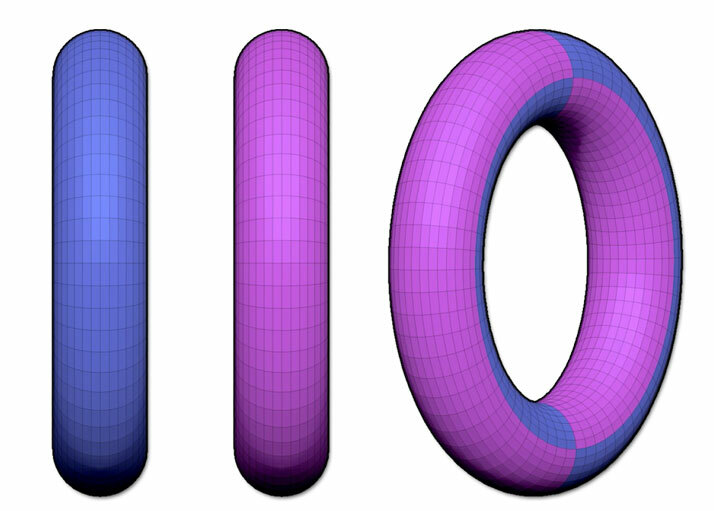 At the right, an edge loop has been added with a Displacement Amount value. The Coverage slider will apply Polygroup variations when the Group Visible option is used. A setting of 1 (the default) means that there will be complete coverage and only one Polygroup will be created. The Cluster slider controls how Polygroups are in generally the same region when the Group Visible function is modulated by the Coverage slider. This slider works in unison with the Coverage slider, causing the randomly grouped polygons to be more clustered or more spread out across the region. A high value results in the regrouped polygons being clumped together. With a low value, ZBrush will spread the regrouped polygons throughout the visible surface. Group Front creates a new PolyGroup based on the camera’s point of view. A new PolyGroup will be created for all visible polygons facing the camera. Group Front in action: on the left, the original mesh position when the Group Front function is trig­gered. On the right, the same model but with another point of view. Notice the distribution of the PolyGroups. By enabling the Additive option, it is possible to force the next created front group to be added an existing one. The Angle slider defines the tolerance of the front polygon detection. A low value will detect the polygons which are most directly facing the camera while higher values will push the affected area closer to the point where they are perpendicular to the camera. This would then omit only the polygons that are strictly oriented backward. A Polygroup is created from the masked portion of the mesh. On the left, the original mask is shown. In the center, the Polish value is set to 0.2 and at the right, set to 0.5. Notice that for this third example, the polished edges go under the mask because the polish value is too high for a concave shape. 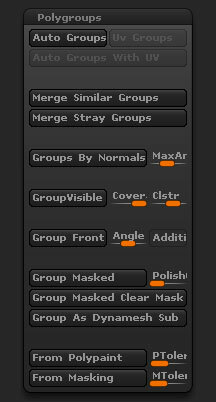 The Polish Grouped Polygons slider controls how much polish is applied to a Polygroup created using Group Masked. If set to 0, the existing boundary of the masked polygons will be unchanged upon PolyGroup creation. Higher values will more aggressively smooth the edges of the PolyGroup boundary. On the left, the original mask is shown. On the right, Group Masked Clear Mask has created a new PolyGroup and automatically removed the mask. A Polygroup is created from the masked portion of the mesh and the mask will automatically be cleared. The Group as DynaMesh Sub function creates a special PolyGroup type dedicated specifically to the DynaMesh system. It keys the grouped polygons to create a negative (Subtracted) mesh when the next DynaMesh remesh is performed. Previously, it was only possible to define a Subtractive surface when using the Insert brush while holding down the Alt key. Thanks to his new feature it is possible to define surfaces as Subtractive at any time. Note: Use this function only for a complete inserted mesh or an entire SubTool. Do not use it on a part of a model. DynaMesh is designed to work only with volumes rather than partial surfaces. As a result, trying to use this option to convert just part of a volume will give unpredictable results. The From Polypaint button will create Polygroups based on the mesh’s polypaint. This function is modulated by the PTolerance slider. The Polypaint Tolerance slider controls how many Polygroups are created when using the From Polypaint button. A higher setting will result in more groups. The From Masking button will create Polygroups based on the masking variations on the mesh, so that fully masked areas may be one Polygroup, partially masked areas another Polygroup, and so on. This function is modulated by the MTolerance slider. The Masking Tolerance slider controls how many Polygroups are created when using the From Masking button. A higher setting will result in more groups.